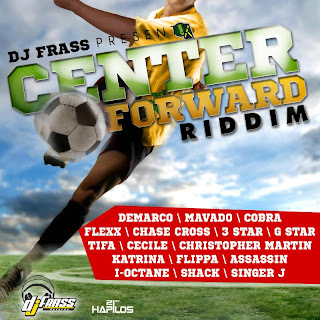 iDancehallReggae.com::Caribbean Lifestyle Media::: DJ Frass Scores Goal With Center Forward Riddim! DJ Frass Scores Goal With Center Forward Riddim! (21st Hapilos Digital) - As in the sport of soccer, the center forward needs to focus on one thing only: creating goals, and it is that approach that DJ Frass took with his latest "Center Forward Riddim": creating hits! The riddim distributed by digital giants 21st Hapilos Digital features some of the biggest names in reggae and dancehall music. From International billboard chart topping Mavado with "Carpet", to soulful singer Christopher Martin, dancehall diva Tifa, legendary dancehall veteran Mad Cobra, "Bad Gyal" songstress Ce'Cile, prolific dancehall lyricist Assasin, talented artist Flexxx "Flexxx in di complex", dancehall/reggae star I-Octane, dancehall narrator Chase Cross, fast rising artist G Star,Katrina, Singer J, Shack and Flippa round up this star studded line up. DJ Frass Records are responsible for such hit riddims as Shellings Riddim, Diamond & Gold Riddimand Special Delivery Riddim amongst many others. Got it Like That - Tifa.